I'm not especially computer literate, so there might be something obvious I'm missing. I'm trying to install SheepShaver. I've download the application, and created a shared folder into which I've put a ROM file and OS 9.0.4 as well. I've tried renaming both files 'Mac OS ROM', but it's not launching. What have I done wrong? 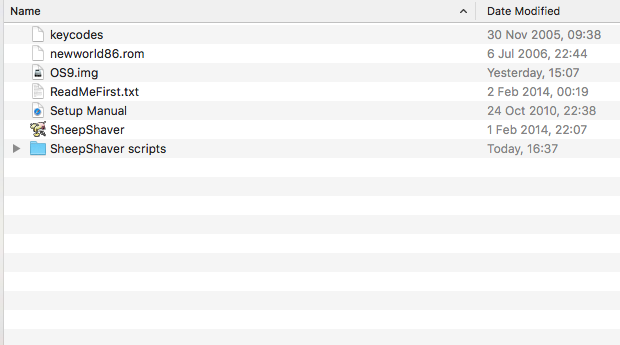 Screenshot attached to show the file I'm looking at: at the moment, all the file names are as I downloaded them. You'll need to take the newworld86.rom file, get info, and rename it Mac OS ROM. If it automatically adds a hidden extension ".rom" you'll have to remove that and click the dialog saying yes, you really do want to remove the file extension. There is an issue with macOS 10.12 Sierra (in fact with an additional new security feature in Sierra) that prevents a newly installed SheepShaver to run. The procedure to get it running is simply to copy the program (only the SheepShaver application itself!) to the desktop, remove the old program in the SheepShaver folder and move the new copy from the desktop to the SheepShaver folder. Thank you both, that's got it working. I'm now trying to install a game from a CD. I've put the CD in the SheepShaver folder, so that it appears within the Unix folder in the VC. It says it needs CarbonLib to run. I downloaded this application, with instructions that it needs to be placed in Extensions in the System folder. When I attempt to do this, however, I get an error message saying I can't because the disk is locked. You probably use a disk image with pre-installed OS9 and erroneously locked that file in the OSX/macOS Finder. The instruction to lock the disk image is intended for an installation disk image, not for a disk image with pre-installed system. Yes, that's worked. Thanks again for you help. One more question. I've created a very large volume (1GB) for the emulator to run the game. However, I get an error message when I go to install saying there's not enough room in OS9 (just 1MB), which I can't seem to increase from Preferences. Is there a way to increase its size? The OS9 disk is too small to allow for additional installations. You can copy the system folder to a larger volume and use that one as startup volume. You could use the 1GB volume you already created. Did you format that volume as HFS+ (Mac OS Extended)? You probably did not install OS9 yourself, but instead use a pre-installed OS9 system (System Folder only) such as can be downloaded from various sources like the redundant robot site. That installation is on a small volume, sufficient for the system only. - In the volumes list in SheepShaver preferences, create a larger volume, for instance 1 or 2 GB (1000 or 2000 MB) in size. - Shut down SheepShaver and start it again. - Allow the new volume to be initialized. 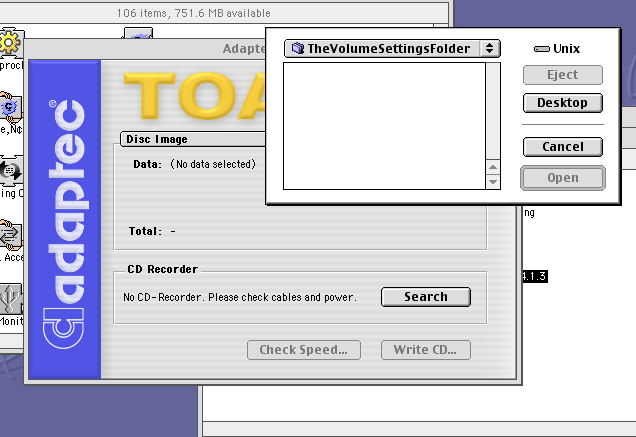 In the dialog, choose an appropriate name for the volume and Mac OS Extended for the format. - In the volumes list in preferences, remove the original OS9 volume, so SheepShaver can start up from the copied system. Thanks for your help again. I've encountered another hiccup. The game installation requires 2 discs. I've copied both files from both disks into the unix in distinct folders. Once the first one has finished installing, it asks for me to put in the 'second disk': is there anyway to trick it into using the appropriate set of files? Depends on the installer, but it's guaranteed not to work correctly from the Unix disk. 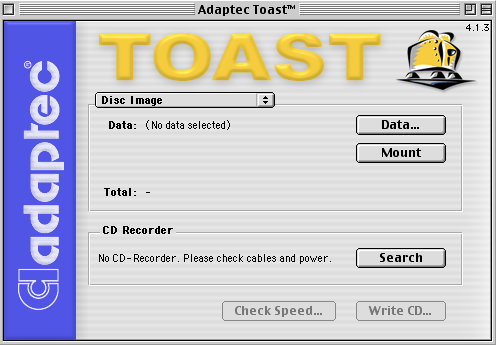 Best solution is to get a copy of Toast inside your OS 9 partition plus the disk images for the two disks... and then use Toast to mount the disks inside the guest OS. Installation should then be a breeze. The Unix folder is for copying between host and guest, not for live file access on the guest from the host. That is known to have numerous problems. 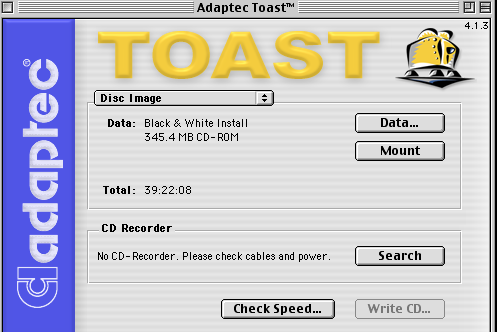 Could you explain how to mount a disk image into Toast please? And thanks for the clarification about the Unix. Always learning! After playing around with it, I open Toast with the emulator and select 'Disk Image' then 'Mount': but it won't let me select the disk image in order to do so: I can only just keep clicking through to other files. Toast is unable to use files from the UNIX volume, like almost all Mac apps. Move the disk image to your emulators "HDD", not to the Mac desktop, and try again please. 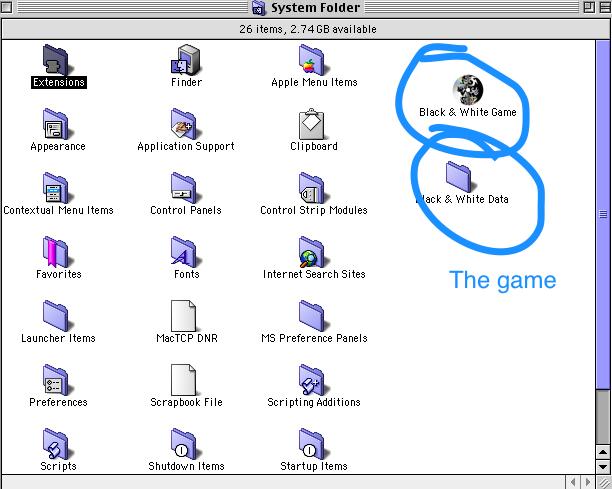 Black & White Install could not be mounted... it contains an unknown file system. Mostly likely... "Foreign file Access" and "ISO 9550 File Access" are not installed. Here's what I'm doing for clarity. I would give up, but I'm actually enjoying learning how this works. I've copied both files from both disks into the unix in distinct folders. It seems that you are not using disk image files, as adespoton assumed, but files copied from the disks. To make an installation succeed, you would need to make disk images from the disks (could be done in Disk Utility, see SheepShaver on OSX tutorial) and mount those image files in SheepShaver. The simplest way to mount disk images in SheepShaver would be to add them to the volumes list in SheepShaver preferences. I've made those disk images now and 'Add'-ed them in the Volumes list in Preferences. When I start SheepShaver it asks me to initialize and that, if I do so, it will delete all the information in those files. What do I do? Did you make sure to choose as format for the images either "read/write" or "DVD/CD Master"? No, that will not work. You have the actual physical CD's? With the CD mounted in OSX, select the CD in the left column in Disk Utility window. Then choose from the File menu "New Image" and from the submenu "Image from <name of the CD>"
Then, in the Save dialog, choose the location where you want to save the image file and at the bottom of the Save dialog choose "DVD/CD master" for the Format and "none" for Encryption. Click Save. You may need to enter your administrator password. Be patient, the procedure will take several minutes, especially reading the CD will take time. When ready, the created file <name of the CD>.cdr is the disk image file that you can add to the volumes list in SheepShaver preferences. Best lock the image file in OSX Finder Info to make it look to SheepShaver like a (non-writeable) CD. I understand that the game is on two disks, so you will need two image files and both mounted in SheepShaver. Note that changes in SheepShaver preferences take effect after quitting SheepShaver and starting it again. I haven't had quite as good luck. After I control escape SS and replace it, I get a screen that is the correct dimensions I chose but still has the disk with the question mark. What am I missing? The blinking question mark says that MacOS can not find a volume with a blessed System folder on it. Please take notice of the remarks about OldWorldROM.